May 4 has become an unofficial holiday, of sorts, at least for “Star Wars” fans. 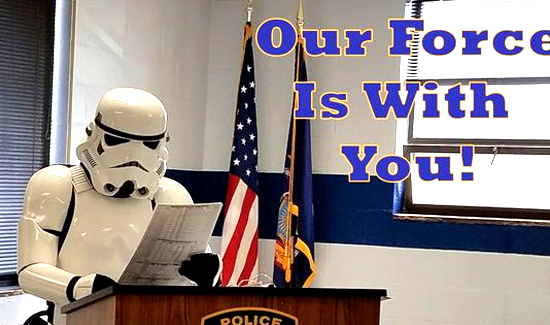 Don’t be surprised to hear “May the 4th be with you,” as you go about your day — including at the Yorktown (NY) Police Department. The department today posted on Facebook a photo that appears to show a fully armored stormtrooper giving a briefing. The photo is captioned, “May our force be with you,” and promotes a pizza-with-the-public event, 4:30 p.m at Yorktown Pizza and Pasta. There was no comment on the implicit suggestion that the department’s officers are, in fact, stormtroopers. The Yorktown Police Department is known for some Facebook hi-jinks. Over the winter, the department often posted long, humorous updates during snowstorms and power outages. “Holy Jeez you people have an unquenchable thirst for the Vino,” one post read. At the time, Chief Robert Noble said the goal was to communicate with residents and bring a little “levity” to a difficult situation. “A little bit of laughter can make some people’s lives better in this situation,” he said then.